Apple's tax benefits in Ireland are illegal, and the company will have to pay up to €13 billion (US$14.5 billion) in back taxes, plus interest. 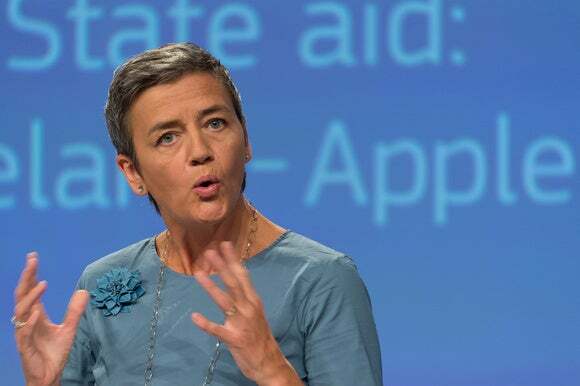 That's the verdict European Commissioner Margrethe Vestager delivered Tuesday, wrapping up a two-year investigation of the company's tax affairs stretching back to 2003. The investigation found that Apple's effective tax rate on profit reported in Ireland was just €500 per million euros in profit, falling to €50 per million in 2014. Apple and the Irish tax authority disputed the Commission’s charges. "I would have a feeling if my effective tax rate were 0.05 percent, falling to 0.005 percent. I would feel that maybe I should have another look at my tax bill," she said. The Commission looked into tax rulings granted by the Irish government to two Apple subsidiaries, Apple Operations Europe, which makes some Apple computers, and Apple Sales International, which resells the company's products throughout Europe, the Middle East, Africa and India. The latter accounts for almost all the unpaid taxes Ireland now needs to recover, Vestager said. 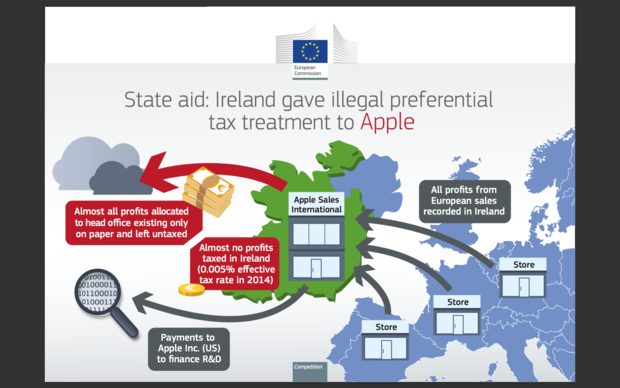 Apple must repay up to €13 billion (US$14.5 billion) in underpaid taxes in Ireland, the European Commission ruled on Aug. 30, 2016. Vestager said that the Irish tax authorities had allowed Apple to split profit from the two companies, which were subject to normal taxes, with "head office" companies that were subject to no taxes, either in Ireland or elsewhere. "Splitting the profits did not have any factual or economic justification. The so-called head office had no employees, no premises, no real activities," she said. Those head-office companies were allocated almost all the profits. This selective tax treatment in Ireland is illegal under European Union state aid rules, she said, and distorts competition. To restore fair competition, Ireland must recover up to €13 billion in back taxes from Apple for the period from 2003 to 2014. 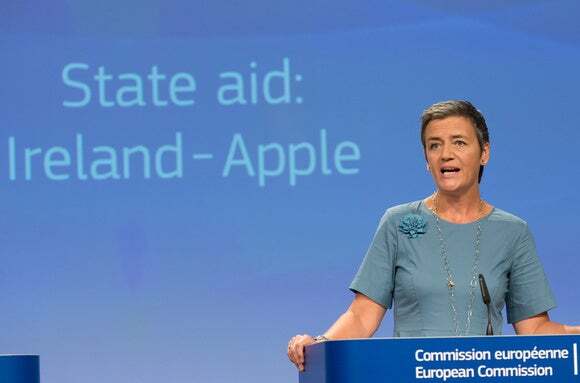 Margrethe Vestager, Europe's Competition Commissioner, speaks at a Brussels news conference on August 30, 2016, held to announce the results of a probe into tax breaks between Ireland and Apple. "It is for the Irish authorities to determine the exact amount and the modalities of payment," she said. Apple will have to pay up even if the ruling is appealed, with the money going into an escrow account, she said. Should the U.S. government decide to change its tax rules so that Apple owes more tax in the U.S. on its EU profits, then the sum to be repaid in Ireland could be reduced by a corresponding amount, she said. Apple is not the only company in the Commission's sights: It has also issued tax rulings against Starbucks and Fiat, and is still investigating Amazon.com and McDonalds in Luxembourg, Vestager said. "All companies, big or small, should pay taxes where they make their profits. We need changes in corporate philosophies, and we need changes in legislation to address loopholes and to ensure transparency," she concluded. Apple plans to appeal the ruling. The Commission’s claim that Ireland gave the company a special deal on taxes "has no basis in fact or in law,” CEO Tim Cook wrote in an open letter to its customers. The company neither asked for nor received any special deals, he said. "We now find ourselves in the unusual position of being ordered to retroactively pay additional taxes to a government that says we don't owe them any more than we've already paid,” and the Commission is proposing to replace Irish tax laws with its view of what they should have been, he said. Revenue, the Irish tax and customs authority, echoed Apple’s line. "We have provided all relevant information and explanations to the Commission. These demonstrate that Revenue collected the full amount of tax due from Apple in accordance with Irish tax law,” it said.